Tips for Low Back Pain. If your low back pain is present primarily when you are weight bearing, your feet might be one of the contributing factors. If you have “flat feet” or “high arches” ask your Physical Therapist what type of orthotic will be best for you. Putting an orthotic in your shoes is only part of the solution. Ask your Physical Therapist what exercises should be done to help reduce the pain. If you’re a runner, some studies indicate that non-heel strike landing can help to reduce lower extremity and low back pain injuries. Seek the advice of your Physical Therapist for a complete assessment of your low back pain and possible treatment solutions. If you suffer from low back pain, you might take a look at your feet. While low back pain may result from literally hundreds of causes as well as many unknown causes, it may help to take a look at the feet. The anatomy and movement of the foot can contribute to low back pain. Your healthcare professional can examine your lower extremity, assessing the static position of the bones of the feet and more importantly the dynamic position of the feet during gait. If there is too much or too little motion, you may experience the onset of low back pain. What is the connection between low back pain and your feet? First, you might consider the connection between your feet and the lower back. Your feet connect to your leg bones, which connect to your pelvis. Anything that affects the motion of the pelvis can have a direct or indirect effect on the lumbar spine, and this may result in low back pain. Let’s start with the back and work our way down. The lumbar spine consists of 5 vertebras that are positioned in a “C” shape curve. These 5 bones are separated by shock absorbing discs that have a hard outer shell (annulus) and a gel like inside (nucleus pulposus). The last lumbar vertebrae (L5) articulates with the top of the sacrum or S1. This connection “attaches” the lumbar spine to the pelvis. The leg bones are connected to the pelvis. The foot and ankle complex attach to the distal end of the tibia and fibula (shin bones). The talus is situated in the mortise or area created by the ends of the tibia and fibula. The talus sits on top of the calcaneus or heel bone forming the “rear-foot” portion of the complex. The rear-foot is attached to the mid-foot and the mid-foot is attached to the forefoot of the complex. Any excess or lack of motion in the foot can have an effect on the entire leg and eventually the low back. The proper amount of motion is required to absorb shock when the foot hits the ground and the body weight is transferred onto the weight-bearing limb. When you have a healthcare professional evaluate you for low back pain, you should have the position of your feet assessed in a static and dynamic state. 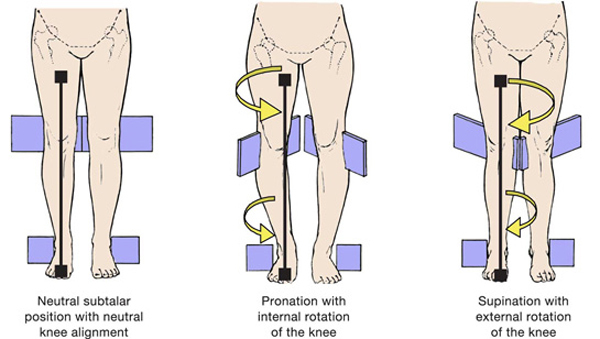 Too much pronation (flat footed appearance) can cause low back pain due to excess motion of the lower extremity bones. Here is what happens: the talus “drops” and causes the tibia to internally rotate. The femur follows and eventually causes the pelvis to rotate excessively. Once the pelvis moves too much, the lumbar spine is compromised leading to an onset of pain. This excess motion is more pronounced when you perform an activity that includes a high impact landing like running or jumping. The healthcare professional may also determine that the feet have too little motion (pes cavus or “high arches”) in either static or dynamic positions. In this case, you will most likely have an onset of low back pain due to the lack of shock absorption. This can lead to impact type injuries. The lumbar spine evaluation must include a “screening” of the lower extremities to include the feet. The choice of treatment in many cases is to place an orthotic or shoe insert into the patients’ shoes. A firm or semi-rigid orthotic is commonly used to add support to a foot that over-pronates and a cushioning type orthotic is used when the person’s feet do not have enough motion to produce a shock absorbing result. Low back pain is one of the most common ailments in all cultures throughout the world. Many painful conditions can be resolved or the intensity of the symptoms significantly reduced to enable the person to live a relatively pain-free lifestyle.